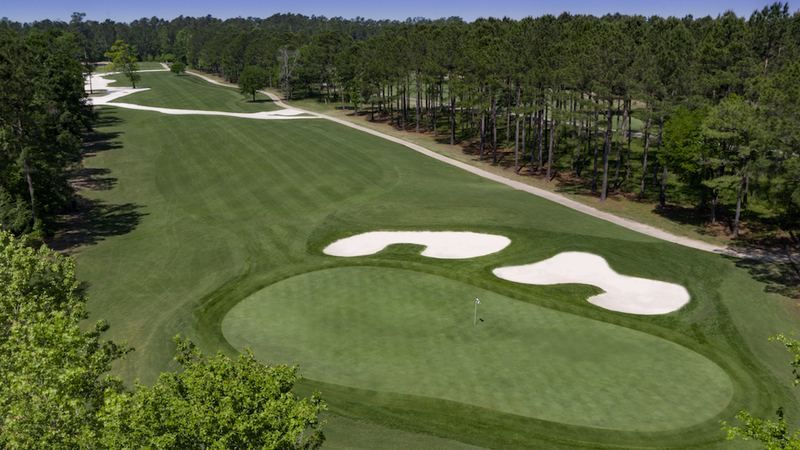 Prestwick Country Club is one of Myrtle Beach’s best-kept secrets, but we’re here to give it a little extra attention. Unlike most courses on the Grand Strand, Prestwick Country Club had not one, but two architectural geniuses behind the beauty of its design: Pete and P.B. Dye. With a name like Dye, it’s no wonder that the 18 holes at Prestwick are an homage to the Scottish links. This par 72 course features generous fairways with gentle undulations that navigate your ball towards rolling greens guarded by pot bunkers and meandering streams. But the course wouldn’t be complete without the innovative use of railroad ties, a Dye signature that can be found all over Prestwick. The masterpiece begins with an incredible run of four par 4s that make up the bulk of the defense on the front nine. Keeping in mind that the course does not give you much time to settle into the round, par is a great score on any of these introductory holes. Arguably the highlight of the front nine is the par-5 9th Hole. It’s a monster of a hole playing as long as 537 yards from the tips. A massive lake borders the left side of the fairway and strategic mounding along the right side eliminates any chance of a bailout tee shot. The elevated 9th green, like many on the course, is guarded by steep bunkers and a prevailing wind. Although a difficult finish to the front side, the 9th Hole at Prestwick is a challenge everyone loves. The back nine is accentuated by two scenic par 3s, No. 13 and No. 16, that both feature water and strategic bunkering/mounding. But the final two holes on this side are what golfers leave the course talking about. The 17th is a long par 5 that has the potential to test every facet of your game. With a meandering stream and relatively precise landing zones, this hole has surely seen more double bogeys than birdies. And if you were hoping for an easy finish, you might be disappointed to see that the 18th Hole is a mirror image of the 9th. Although it plays a tad shorter, it too demands accuracy and precision off the tee and into the green. 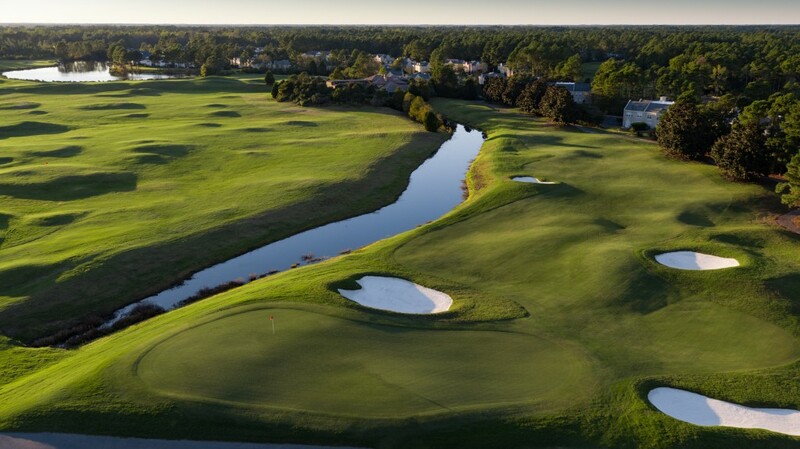 To play Prestwick Country Club and other incredible courses here in Myrtle Beach, check out the Elite Package at MBGolf.com. Enjoy discounted rates in addition to free 9-hole replays at a number of stellar courses, including Prestwick. Click here to learn more or call 888.250.1767 to book a tee time today! Water sports lovers have a new playground, and it’s right here in Myrtle Beach. Shark Wake Park, located in the North Myrtle Beach Park and Sports Complex, was founded by Greg Norman Jr. and officially opened to the public only two years ago. Shark Wake’s most unique feature is that a boat is not required to wakeboard. The park functions using cable systems and nine ramps to ride on as part of the main track. With no experience and no equipment required, Shark Wake is one of the most versatile entertainment complexes on the Grand Strand. If you’re not into wakeboarding, Shark Wake also features an Aqua Park. This inflatable, floating park is the largest on the East Coast, covering roughly an entire acre of water. Whether you’re 10 years old or a parent, you are sure to have a blast here. 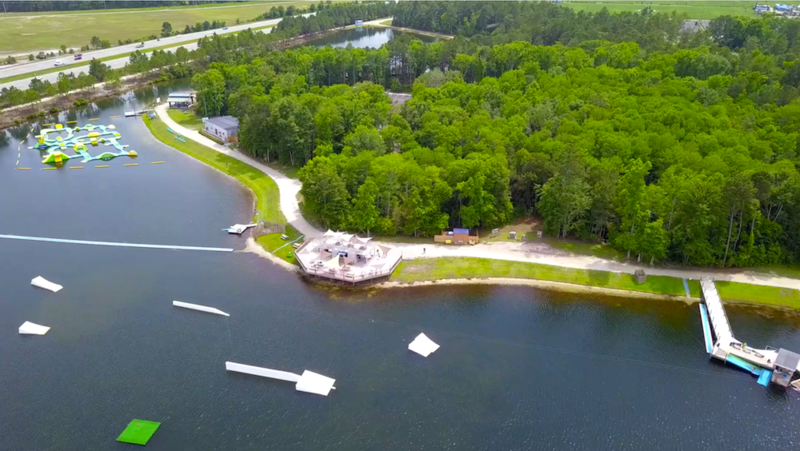 In addition to the water activities, Shark Wake Park also features a waterfront viewing deck, beer garden, and the Shark Shack where you can take a load off after a day on the water with beer, wine, other beverages, and snacks. Shark Wake Park is also conveniently located near dozens of award-winning golf courses, making it the perfect post-round activity for the entire family. Check out our wide range of nearby golf accommodations that will make it easy to include a visit to Shark Wake as part of your next golf trip! Myrtle Beach has so much to offer that planning a trip to “The Golf Capital of the World” may seem a bit daunting. But don’t fret. You can rest assured your next Myrtle Beach golf trip will exceed your expectations by working with the specialists at MBGolf.com! One way to get the most bang for your buck is with the all-inclusive Legends Golf Package. Prices for this deal start as low as $396 for four nights’ lodging and four rounds of award-winning golf. This “legendary” deal also includes breakfast, lunch and two beers with each round of golf you play, at any of the five Legends Group courses available on this package. 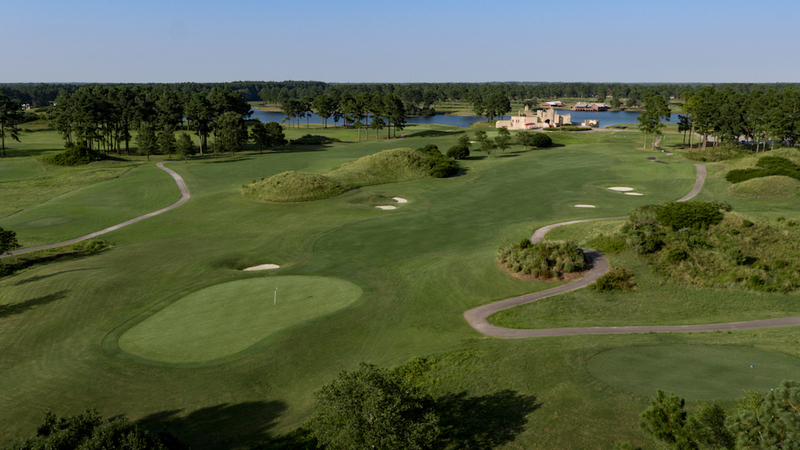 This quintet of phenomenal golf courses, all with their own distinct features, are must-plays in Myrtle Beach. The first of this group is Heathland, a links-style course with difficult prevailing wind, deep bunkers, and a thick rough. A similar setup can be found at Moorland, with dozens of natural undulations, bunkers, and water hazards. Wide-open holes and the relative absence of vegetation are left behind after arriving to the tree-lined fairways at Parkland, featuring multi-level greens and brand-new bunkers. The fourth course in this grouping, Oyster Bay, showcases elevated and island greens and a variety of water hazards and hole setups – the culmination of everything you could imagine on a golf course. Not to be outdone, Heritage Club, built upon the historic site of a former indigo and rice plantation, features dozens of live oaks and scenic marshland. In addition to these outstanding golf options, the Legends Package allows you to choose from a wide variety of lodging accommodations. Some of these options include, but are not limited to, premium oceanfront condos, resort villas, and luxurious beach homes. Conveniently located near golf courses, dining, and nightlife, you can’t go wrong with any of these lodging selections. To get a quote and start planning your next Myrtle Beach golf getaway, click here or call 800.422.1587 today! People always ask, which course is the best in Myrtle Beach? A better question might be, which course is the area’s most underrated? It’s a subjective debate, but there is no doubting Shaftesbury Glen’s rising place in the market. The Clyde Johnston design opened in 2001 and has always been regarded as a good course, but a 2016 renovation project has taken Shaftesbury to a new level. The makeover included the addition of 250,000 square feet of waste bunkers, which frame many fairways and add considerably to the layout’s visual appeal. Perhaps best of all, the additional sand doesn’t make the course significantly more difficult as the bunkers are generally shallow. A trade-off for the fairway hazards was the removal or softening of several greenside bunkers, making the changes a net positive for your handicap. Combine those alterations with Shaftesbury’s bentgrass greens, which are among the area’s best, and it’s not hard to see why the course continues to gain in popularity as it nears its 20th birthday. The bentgrass thrives throughout the winter and spring months, and Shaftesbury’s open design helps ensure the greens remain healthy throughout the summer, leading to prime conditions each fall. 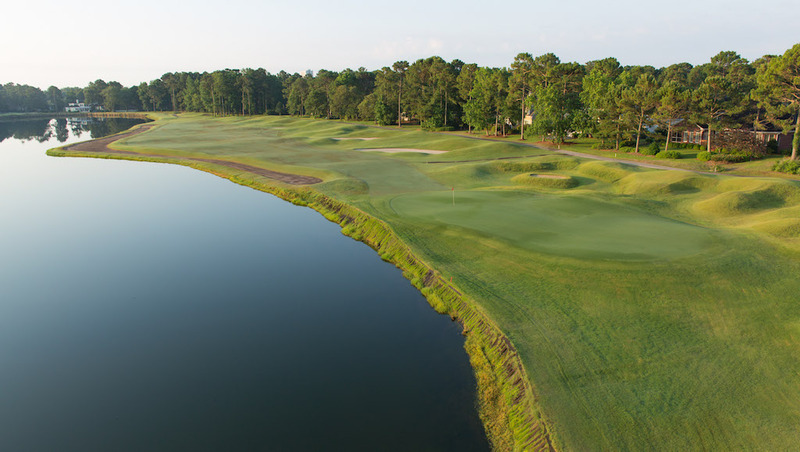 Locals and informed group leaders are dialed into the enhanced experience at Shaftesbury Glen but many are still catching up, leading to its place at or near the top of our list of Myrtle Beach’s most underrated courses. Being on that list means outstanding golf and tremendous value, and Shaftesbury delivers on both accounts. No hole better captures the “new” Shaftesbury Glen than the 13th, a 497-yard (white tees) par 5. A waste bunker now runs up the right side, providing visual contrast on a hole that is reachable in two for long hitters, but a well bunkered green that is long and narrow demands a quality approach. If you are booking the Myrtle Beach’s Best package or the Ultimate Glens Group deal, Shaftesbury Glen will make your next trip a little better. Myrtle Beach area golfers now have a new, must-see 19th Hole destination at one of the nation’s most popular sports bars, Dave & Buster’s at Broadway at the Beach. Featuring a massive arcade, expansive menu and dozens of televisions, Dave & Buster’s is sure to offer hours of post-round fun. The Dave & Buster’s menu offers a variety of burgers, wings, steaks, seafood, pasta, and innovative appetizers as well as options that are more health-conscious. Needless to say, there is something for everyone. In addition to the enticing food, the drink menu is sure to catch your eye. Unique options like the Green Ghost Glow Kones and the Raging Berry Bull are just as tasty as they sound. One of the hallmarks of Dave & Buster’s is the “eat and play” special. This promotion includes dinner or an appetizer and $10 worth of points to use in the arcade, all for a grand total of just $17.99. From Guitar Hero to Skee-Ball, Dave & Buster’s is sure to make any adult feel like a kid again. And if you couldn’t beat your playing partners on the course, the Dave & Buster’s arcade is undoubtedly the most appropriate place to get revenge! Located in Celebrity Square at Broadway at the Beach, Dave & Buster’s ideal location puts it mere yards away from a waterfront boardwalk lined with other restaurants, a variety of shops, a sea aquarium, and multiple other attractions including a mirror maze and miniature golf course. In addition, its central location puts the sports bar smack-dab in the middle of dozens of exceptional surrounding golf courses. It goes without saying that Dave & Buster’s has made for an excellent addition to Broadway at the Beach and the Grand Strand area as a whole. It’s delectable food and fun-packed arcade make Dave & Buster’s the perfect post-round stop to include on your next golf trip! Aside from golf, at top of the priority list for most our groups is where to find the best seafood in Myrtle Beach. With fresh locally caught fish going straight from the boat to your plate, finding a place that serves outstanding seafood is relatively easy, ranking the best the area has to offer is far more difficult. But, we are here for you. Here is a look at the places we recommend golfers enjoy an outstanding seafood dinner with two caveats: this list only takes into account restaurants in Myrtle and North Myrtle AND it has to be a seafood-centric restaurant (so places like Aspen Grille, which is outstanding, won’t be included). 5. Located across from Barefoot Resort in North Myrtle Beach, Rockefellers Raw Bar is an area institution. A nondescript building can’t obscure the food, particularly the shellfish. Oysters, clams, shrimp, scallops and mussels are the specialties at a restaurant us locals (and TripAdvisor readers) swear by. 4. Mr. Fish doubles as a restaurant and fish market, serving fresh seafood anyway you want it. The in-house dining is very good, but Mr. Fish gets bonus points for the market, allowing golf groups to prepare their own dinner (every group has at least one guy that cooks well) if they want. 3. Admittedly, it’s not fresh, but no list of Myrtle Beach’s best seafood restaurants is complete without a buffet, and Original Benjamins, which claims to have introduced calabash style seafood to the area, is the best. The buffet features more than 170 items, including crab legs, so if it’s quantity you desire, this is your spot. 2. Sea Captain’s House is Myrtle Beach’s oldest and most popular seafood restaurant. The food is outstanding and the view overlooking the Atlantic Ocean is at least as good. The combination of food (the jambalaya comes highly recommended) and ambiance is hard to beat. 1. Forget being the best North Myrtle Beach has to offer, SeaBlue has set its sights much higher, saying, “We aspire to be among the best restaurants in the country, using locally sourced ingredients and displaying five-star service to all our guests.” According to 644 TripAdvisor reviews, Sea Blue has already conquered the local market and one look at the menu and you will see why the rest of America is next. Part of the Mystical family of golf courses, the Wizard touts its links bona fides – the mounding, gorse and sod-faced bunkers for starters – but the Dan Maples design defies easy description, and that’s a big part of our affinity for the layout. If you’ve never been to Scotland, the Wizard provides a reasonable facsimile in spots, but the course manages to successfully keep one foot in new world course architecture and the other in the old. The opening hole, a dogleg right par 5 that plays around a lake, is a contemporary American challenge, but by the time golfers arrive at No. 4, a par 3 that features stacked sod bunkers, they are enjoying a taste of the game’s ancestral homeland. The Wizard’s fairways are enormous, but the key to success isn’t merely finding the short grass. Playing to the proper place in the fairway will position you to hit the course’s mammoth greens in spots that will give you a chance to score. The smallest green at the Wizard is more than 10,000-square-feet (for a frame of reference, the average size is approximately 6,000-square feet), so finding the dance floor won’t be a problem. The key to scoring is proximity to pin and avoiding those 40-foot putts. Speaking of the Wizard’s greens, the course is one of the few that still has bentgrass, and the game’s premier putting surface thrives in the open environment. While golfers enjoy the links-style experience and a chance to score, the challenge stiffens on the final three holes, which offer a more conventional design. The 17th hole is an island green par 3 that plays from an elevated tee box, and the 18th is, essentially, an island hole as it is surrounded by a lake. The approach on the 394-yard 18th hole (regular tees) is among Myrtle Beach’s most daunting, requiring a carry over water with a mid to long iron. It’s an outstanding finish to a golf course that provides a taste of Scotland and a whole lot of fun. Aside from golf, at the top of the priority list for most our groups is where to find the best seafood in Myrtle Beach. 3. No list of Myrtle Beach’s best seafood restaurants is complete without a buffet, and Original Benjamins, which claims to have introduced calabash style seafood to the area, is the best. The buffet features more than 170 items, including crab legs, so if it’s quantity you desire, this is your spot. 2. Sea Captain’s House is Myrtle Beach’s oldest and most popular seafood restaurant. The food is outstanding and the view overlooking the Atlantic Ocean equally as enjoyable. The combination of food (the jambalaya comes highly recommended) and ambiance is hard to beat. It’s a hot summer’s day in Myrtle Beach. Your golf group decided it would be a good idea to play 36 holes. Well that 36 turned into 45 because Tom and Steve tied for the lowest total score of the day and wanted to settle it. You’re not going to sit back and watch so you decide to drag yourself through the pain. On the 43rd hole of the day Jim says “Where are we going to eat?” A couple suggestions get thrown out that aren’t good then you have a genius idea. “Let’s go to RipTydz!” you yell, and all of sudden you are looked at as a hero. If you haven’t heard of RipTydz, it’s ok – it just got finished being built last summer. RipTydz is a modern oceanfront dining and bar experience unlike any other place in Myrtle Beach. Located on 13th Ave North on Ocean Boulevard, RipTydz features multi-level dining and a rooftop bar. Riptydz has a multitude of menus to choose from – whether you want to go and get a snack and a beer or go and get a full meal with your family and friends. If you decide to go and get a light meal and a drink, take a look at the Beach Side Starters menu. The starters menu includes crispy fried calamari, mahogany chicken tenders and wingtydz. For your main course, you have a lot of different options to choose from. If you are in the mode for tacos check out the dockside tacos menu. That includes Baja steak tacos, rip’n shrimp tacos, and fish tacos. If you want a sandwich, take a look at the sunburn sammies menu. This menu includes old bay po boy, lobster rollz, and cheesesteak sandwich. If you’re looking for a more traditional seafood experience check out Riptydz’s ocean favorites menu. This menu includes traditional seafood such as shrimp and grits, and a coastal fried platter which includes a variety of seafood and sauces. RipTydz has more than just seafood on the menu. Check out their mainland favorites menu which includes a hand cut ribeye, jerk style grilled chicken, and big island style ribs. RipTydz also has an extensive drink menu with a large selection of beers on tap and specialty drinks. Along with its diverse drink and food menu, RipTydz also features live music on the weekends. If you haven’t visited this soon-to-be favorite evening attraction, do so during your next visit to Myrtle Beach!